Anne asks, "I rebooted my computer after a recent update and now all my .jpg images have that white icon with the mini window inside instead of the icon that looks like a sunset. What happened? How can I fix this?" When a standard file type, like the JPEG type of most photos, no longer has a photo viewing program associated with it, Windows defaults to showing you a generic icon for those photo files. This typically happens when the file association for that particular file format gets lost. Windows update, uninstalling an application, or installing a new application all have the potential to cause file associations to get lost. For instance, sometimes when you install a new app on Windows, the default app for opening a file will get lost. This problem isn't limited to photo files either. Another common scenario is to have music files not open in a media player, like Windows Media Player or iTunes, because Windows stopped recognizing the files as music. When Windows no longer has a preference saved you need to reset the association with the application you want Windows to use to open a particular file type. In the case of your .jpg image files, you are seeing the generic Windiws icon because Windows no longer has a picture viewer app assigned to open pictures. 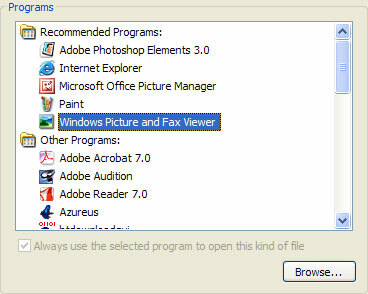 Typically, if you never change the Windows default, this is the Windows Picture and Fax Viewer. Depending on what other image viewing and editing applications you install, this may change to something like Irfanview, Photoshop, or one of the dozens of image manipulation tools. You can easily correct the file association for your .jpg photos, which restores the default application for opening .jpg files and changes the .jpg icon to match the icon for your default app. To repair the file association for your .jpg files, you need to correct the file properties. Right-click on any JPEG file and choose properties from the right-click menu. On the General tab, click the change button next it Opens With. If you have a preferred image editing app select that. For purposes of this demonstration I'm selecting Windows Picture and Fax Viewer. When you click OK you should see all JPEG files on your system with an icon that looks something like what's pictured at the left here. When you correct file associations for one file, Windows sets the default for all files of that type on your system.